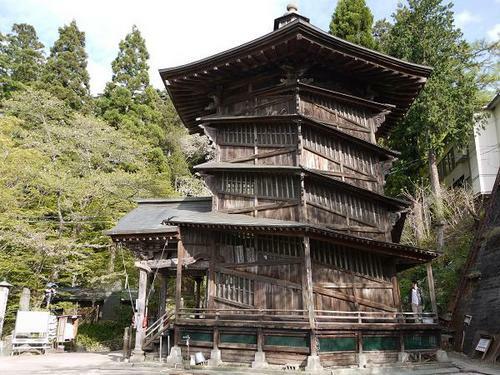 ‘Sazae-do’,a general term for turbo-shaped shrines, were built all over Eastern Japan late in the Edo period. ‘Sazae-do’ in the picture, whose formal name is ‘Entsu-sanso-do’, can be seen halfway up ‘Iimori-yama’ Hill in Aizu-wakamatsu,Fukusima Prefecture. This eccentric wooden building built late in the 18th century is placed on the list of important cultural assets. The inside of the hexagonal building, a clockwise rising ramp runs from the entrance to the top then it becomes a descending spiral ramp from the top to the exit. You can go up and down without meeting other visitors because this building has a double spiral ramps. Divine favor can be received through praying three Buddhist images placed in the building, instead of making a hard and long pilgrimage.